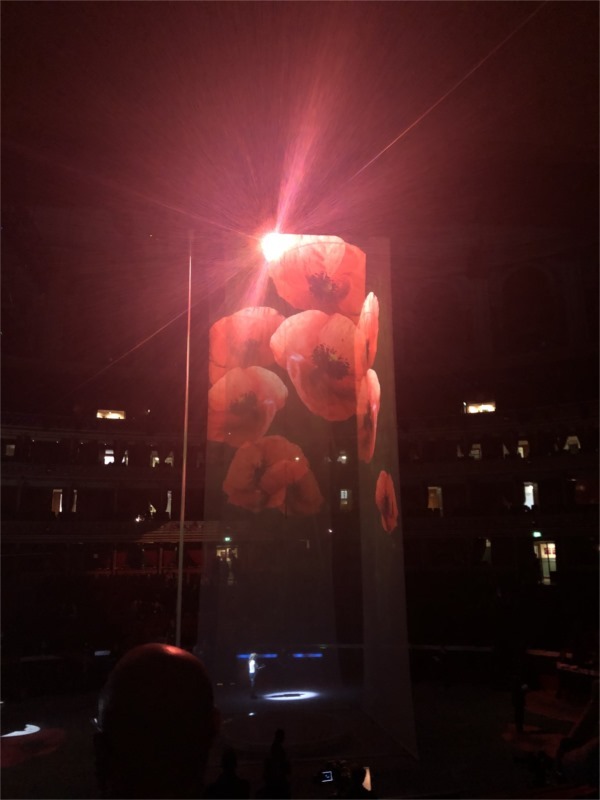 For those that have asked, I was invited to take part in Armistice 2018, A Nation’s Thank You as part of the public ballot. To be honest I never expected to be offered a place when I applied and was ‘over the moon’ when I received confirmation. As you can imagine, I didn’t get home particularly early from the Festival of Remembrance on Saturday night so opportunity for sleep was limited! I was back out of the house on Sunday morning at 6.15am to travel to Cockfosters. When I arrived, the car park was already starting to fill up – it was so much busier than it had been on Saturday. As I headed into the station, I joined many others, decked with medals either those earned personally (worn on the left) or those of close relatives (worn on the right, in case you were wondering) that were also heading to Remembrance Sunday parades. Several of us exited at Green Park just after 8.15am and made our way out of the station. The event seemed very well organised with lots of helpers on hand to provide directions and advice. As we neared The Mall, there were recycling centres provided to collect the cardboard boxes that we had been transporting our Poppy wreathes in. As we entered The Mall, we were asked for Proof of Identity and those with bags were subject to a security check. We were then directed to booths where our identity was checked again and we were allocated to the column that we would be processing in. I was fortunate to be allocated to Column A which would lead the entire procession! In total there was to be 12 columns with around 800 people allocated to each. We were directed towards Admiralty Arch passing ‘holding’ areas for each column along the way. Half way along, there was an opportunity to look at a couple of Buses on display from the London Transport museum. 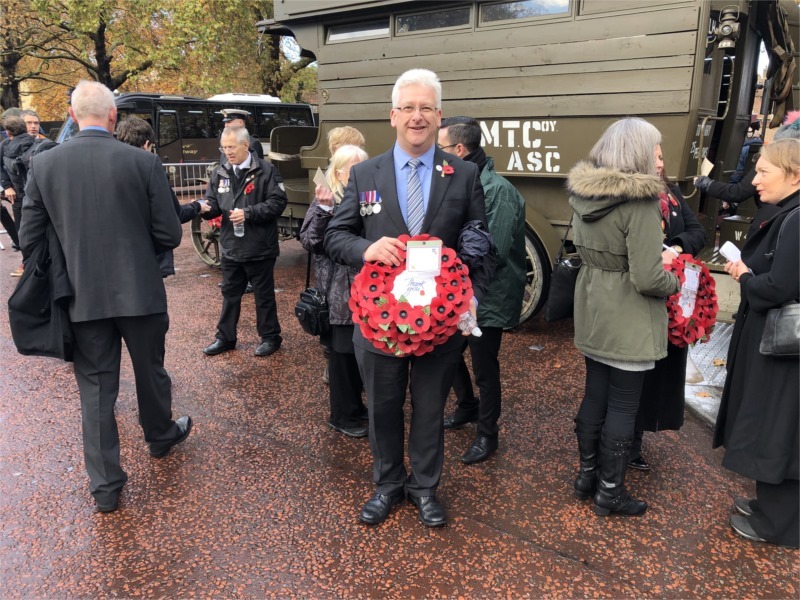 The one that I am standing next to for my photo was requisitioned by the War Department in 1914 and restored to operational condition in 2014 to commemorate the role such buses had transporting troops to and from the front line during the First World War. Continuing along The Mall, I arrived at the holding areas for Columns A and B which were next to the Royal Artillery Boer War Memorial. 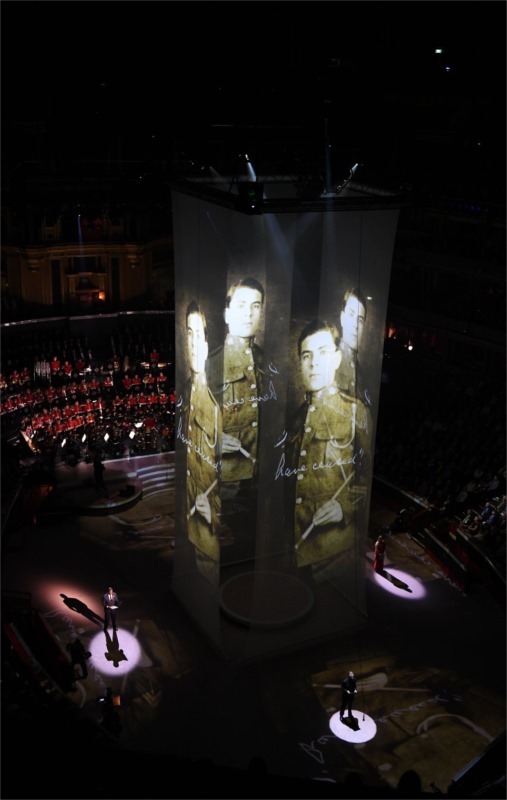 Large screens had been erected so we could watch the Service of Remembrance broadcast from the Cenotaph. Stalls had been erected which provided tea, coffee and pastries which were very welcome. Slowly, the columns started to form although we didn’t need to be ready until 12.00pm. The British love a queue don’t they! 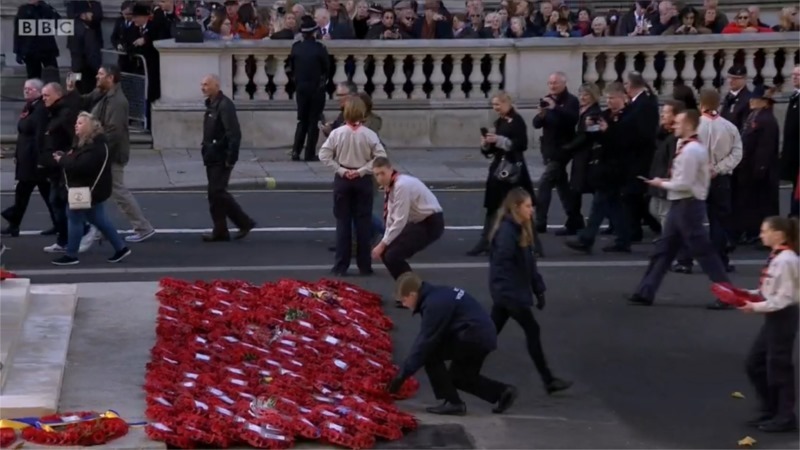 Those with wreaths asked to form up on the left of each column to make it easier to hand them over as we approached the Cenotaph. While we waited, there was lots of opportunity to chat. Nearest to where I was standing, there were participants from all over UK including Woking, Lewes, Worcester, Northumberland and Cornwall. Most were remembering particular relatives but some were taking part to remember entire communities. At 10.20am, The King’s Troop, Royal Horse Artillery rode past heading towards Horseguards Parade. The relevance of this would become clearer later! 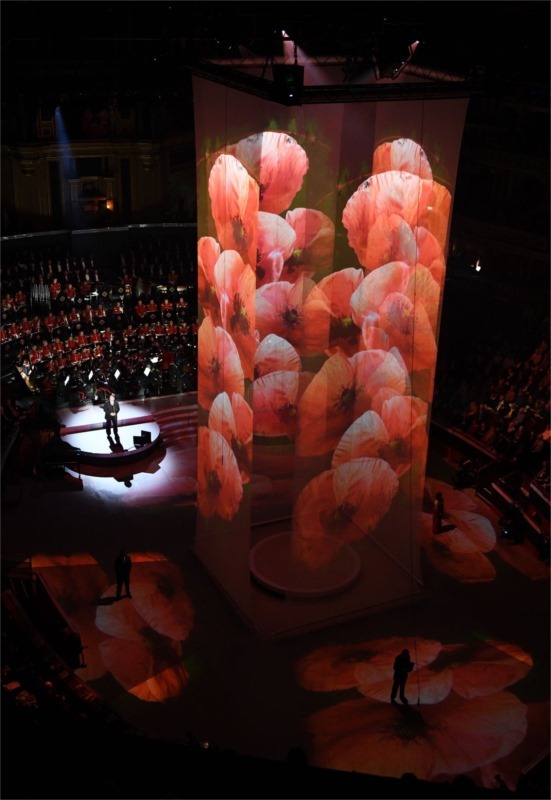 Shortly after, the screens started to show the BBC coverage from Whitehall and the arrival of the Clergy, Chiefs of Staff, Politicians, the Royal Family and the President of Germany who would be taking part in the Service of Remembrance. At 11.00AM the beginning of The Silence was signalled by the guns of the King’s Troop! I hadn’t noticed but they must have been very close to us. The volley was so loud compared with the much more ‘distant’ sound that was audible on the TV coverage. I am so used to the The Exhortation being read and the Last Post signalling the start of the silence, I wasn’t really expecting it. The other thing that hadn’t occurred to me was that Big Ben had been reinstated to strike 11.00AM and commemorate those that died in the two world wars and later conflicts. 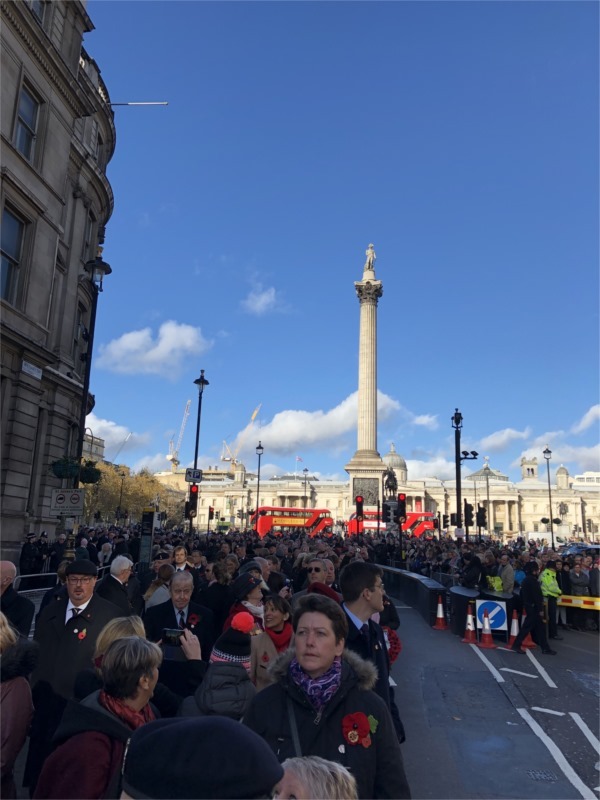 At 11.02, the silence was ended by the guns of the King’s Troop again (although we were all expecting it this time) and the service from Whitehall continued on the large screens in front of us. 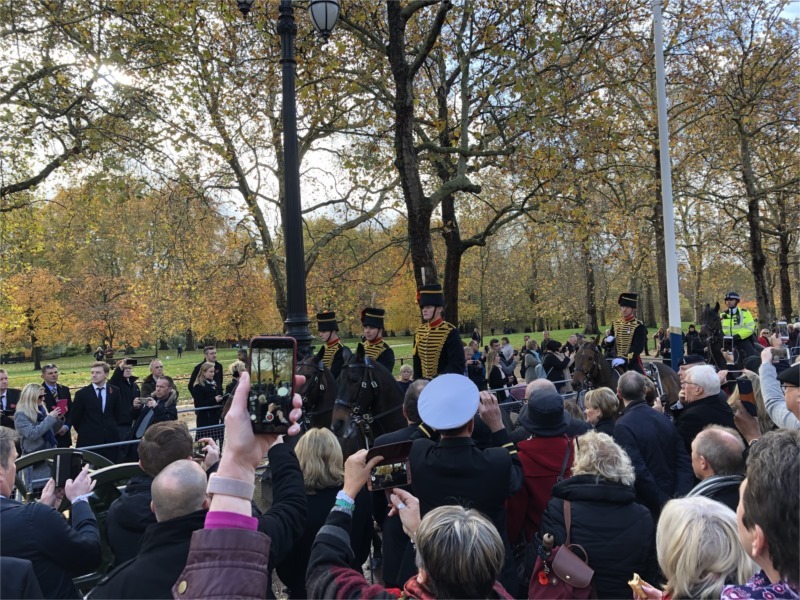 Last Post was played superbly by Buglers from the Royal Marine Band and the wreath laying commenced with Prince Charles laying the first one on behalf of the Sovereign who looked on from the balcony of the Foreign Office. After the dignitaries had completed their wreath laying, the Service of Remembrance concluded with prayers, Reveille and the National Anthem. A few moments passed and then at just before 11.30am, the Veterans started their march past. 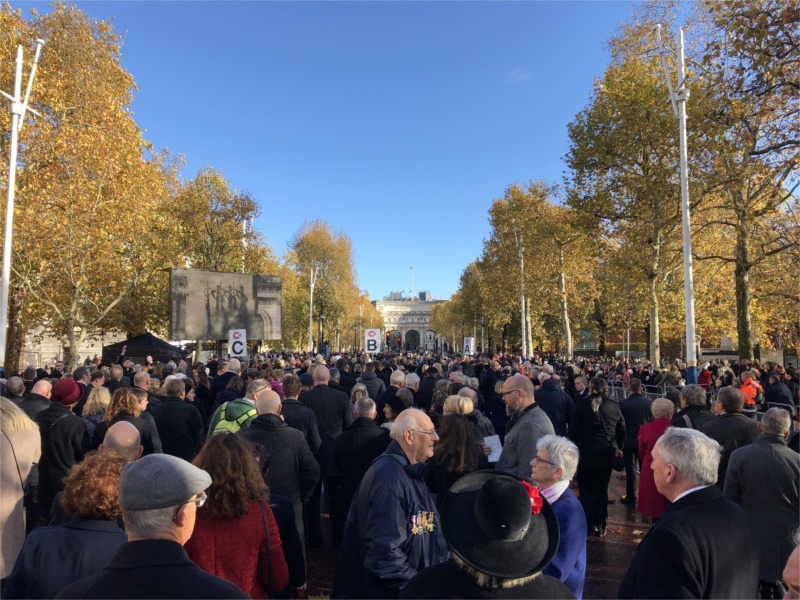 We continued to watch on the large screens as 10,000 Veterans of all ages, paid their respects to the fallen of World War I and World War II as well as wars and conflicts that have taken place since. At 12.20pm, Column A was signalled to move forward and headed through Admiralty Arch, led by the Christ’s Hospital School Band. Spectator areas had been set up from Trafalgar Square onwards and many of those taking part in the procession were looking for friends and relatives lined up as we went by. We turned right into Whitehall where we halted, waiting for the last of the Veterans parade to clear the route ahead of us. At 12.30pm Big Ben struck again. This would be the signal for Bells across the world to ring in thanksgiving for the end of the First World War. We started our procession at 12.45pm and as we went past the Silver Cross Pub, a group of Paras, having completed their march, applauded us. Somehow this didn’t seem right. 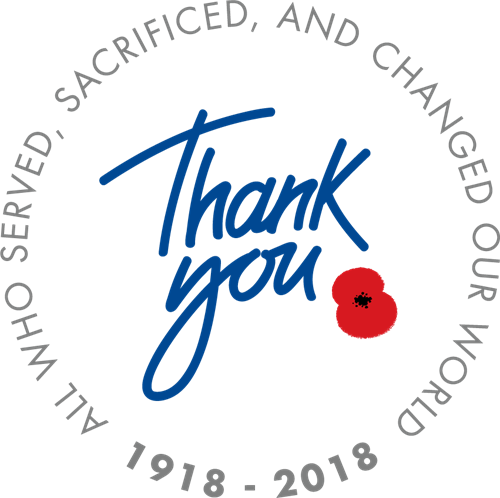 We were processing in thanks for the First World War generation and those around me felt that we should be applauding the veterans and not the other way around! The route was lined with spectators as we headed towards Horseguards building. Dan Snow walked next to us as we headed towards the Women of WWII memorial near Downing Street but there he stopped to interview someone while we carried on. Just before the Cenotaph, our wreaths were handed to Scouts and Guides charged with receiving and laying the wreaths on our behalf while we continued to process by the Cenotaph. It was considerably less formal than the veterans that marched past before us – but then I suppose it was supposed to represent the general public and the general public on the whole, have never been trained to march! 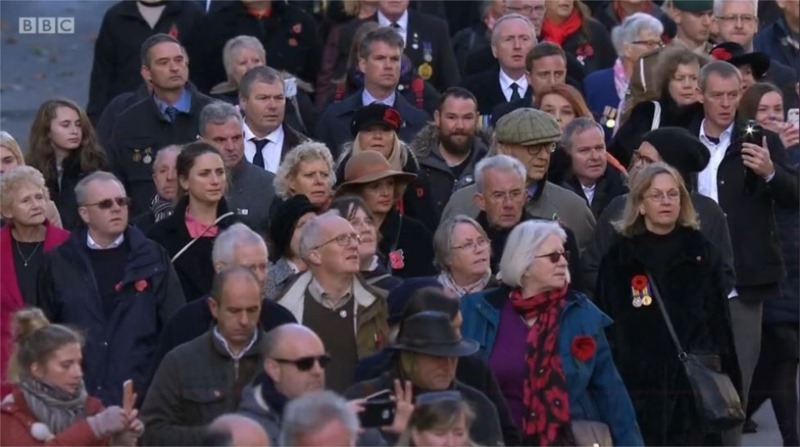 Some stopped to take photos as they reached the Cenotaph and to record their involvement in this historical event. For my part, I tried to perform ‘Eye’s Left’ as smartly as I could to pay my own respects before continuing on towards Parliament Square. Turning right and Birdcage Walk was a sea of spectators as well as veterans that had finished their march past a few minutes earlier. As we approached Wellington Barracks, we turned into St James Park and through the ‘finish’ gantry to dispersal and my incredible weekend drew to a close. After I finished work on Wednesday, I was able to revisit the Cenotaph once more. 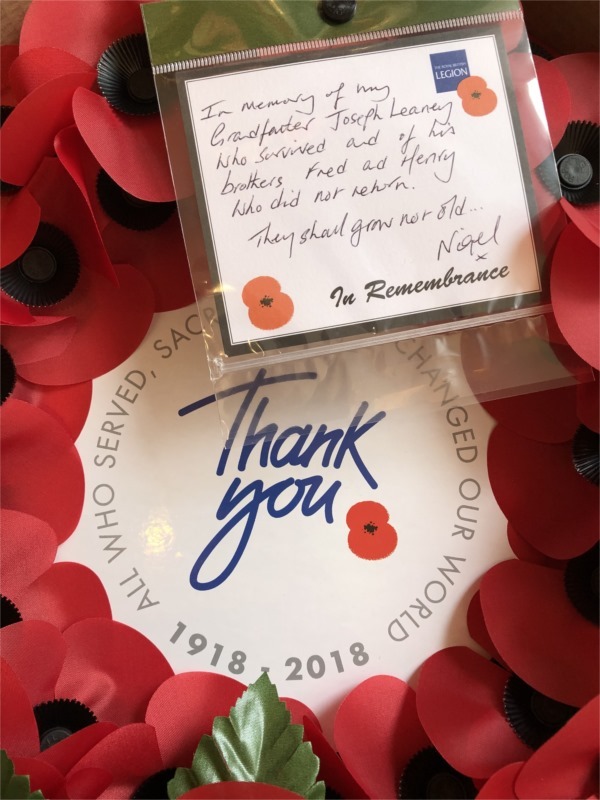 It was humbling to spot the wreaths that I had laid to remember the 11 residents of Westmill, Hertfordshire and in memory of my Grandad Joseph and his brothers Henry and Fred amongst hundreds of other wreaths that had been left. The messages and photographs attached to the wreaths were incredibly touching. The fact that so many people had taken time from their day to look at them too was moving in its own right. As ever, thank you so much for allowing me to share my memories. I’m so sorry that this has taken a few days to post. 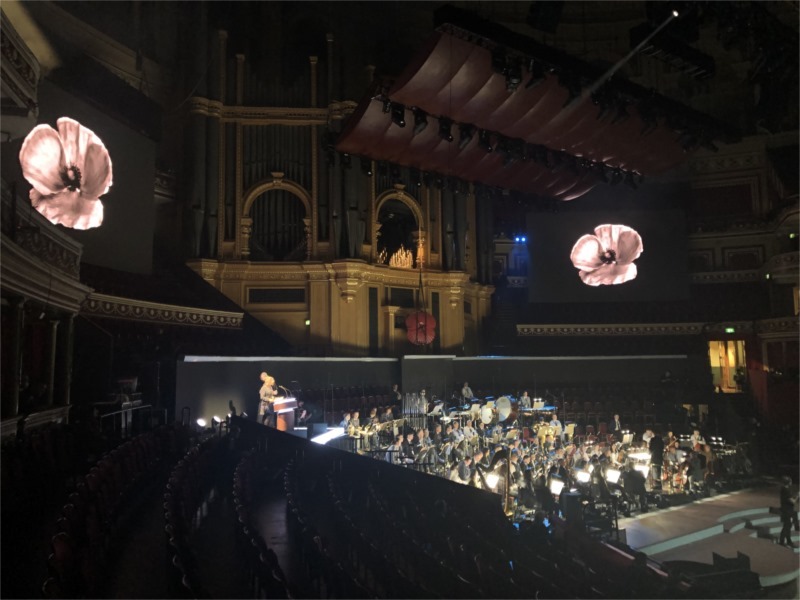 There are a number of reasons – we were asked by the BBC to withhold any photos of rehearsals until after transmission, the whole weekend was a bit manic (as you will read in later posts) and it’s taken a little time for me to process the events and try to get them down in writing to share. 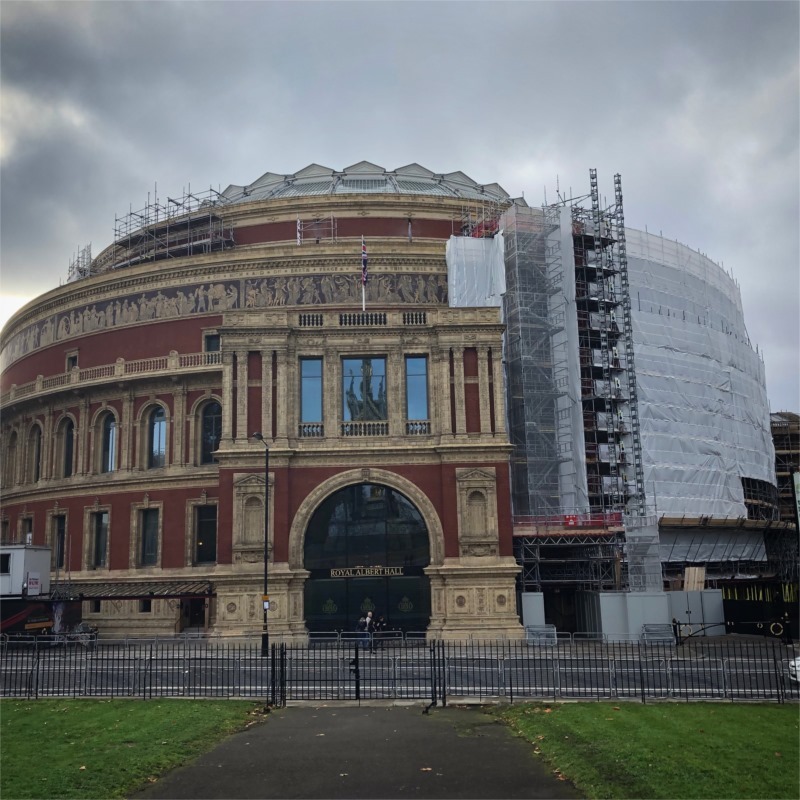 I was out of the door at 6.00am on Friday morning to make sure I could be at the Royal Albert Hall in plenty of time to complete the accreditation process and be collected by my contact from the BBC. I got the first idea that this was not going to be an ordinary weekend as Michael Palin was in front of me in the queue waiting for his security pass! In total, there were to be 60 of us taking part but not everyone was able to attend rehearsals on Friday. Some had little notice of their involvement and were unable to change their plans while others had a significant distance to travel to attend. Once all of the morning attendees had arrived we were given a short briefing by Louise Bracken, the BBC Researcher that had first contacted me. Louise explained that we were to be divided into 4 groups and each assigned a staircase. We would enter the arena using the staircase, holding photographs of our relatives and form a ring around Sheku Kanneh-Mason, the Cellist that played at the Wedding of the Duke and Duchess of Sussex. At 11.15am we headed across to the Albert Hall and the first (of many) trips through airport style security. We split into our groups and arrived at our designated staircase in time to catch the end of Michael Palin’s rehearsal. It was interesting to stand there for a while, taking in the sights and sounds of the rehearsal in progress. My first view of the backdrop on to which animations, photos and video was being projected was astonishing. It wasn’t too long before Sheku arrived in the centre of the arena and started to play. We very quickly recognised our cue (although we weren’t actually told what it would be) and started to process down the staircase and into the arena. A ring of light was projected onto the arena floor for us to follow. We halted and were instructed to turn to face the audience, holding our photographs for everyone to see. It had gone remarkably well for a first attempt. All we needed to do was to adjust our spacing so that we would be evenly distributed. We were thanked and asked to leave the arena and get some lunch. 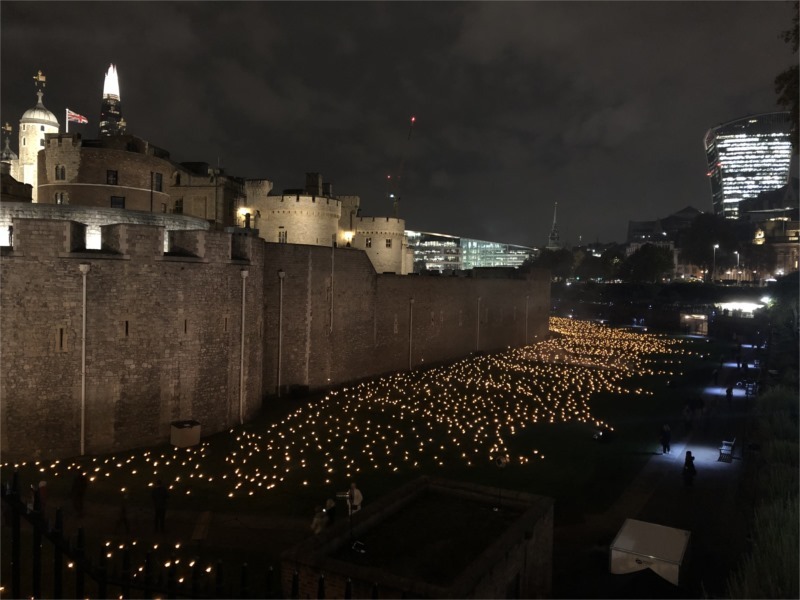 After the second rehearsal, my next stop was the Tower of London to visit the light display that had been staged to mark the centenary of the Armistice – ‘Beyond the Deepening Shadow‘. It was incredibly busy at the Tower (4-5 deep at most viewing points) but I did manage to get a good view. It was amazing to think that I had taken part in the poppy installation 4 years ago. 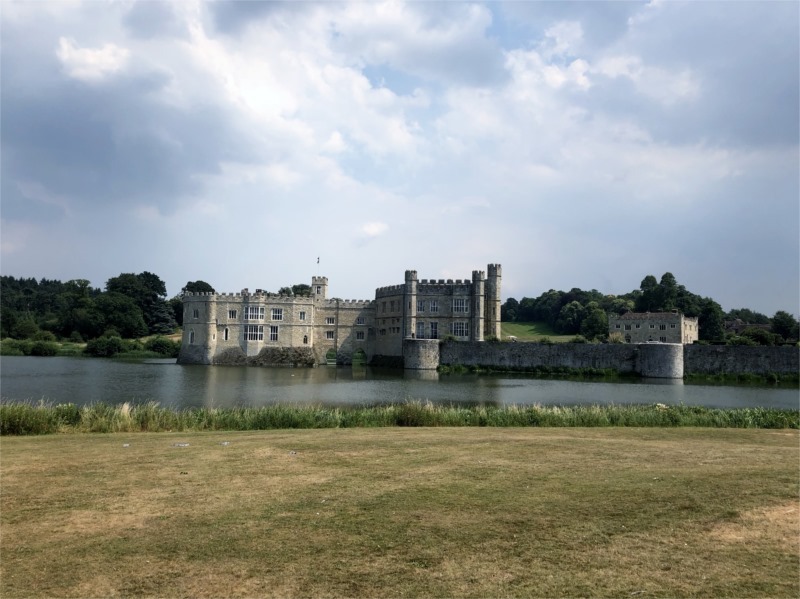 Rather oddly, I have a ‘soft spot’ for the part of the moat that I worked in when planting the poppies and wanted to make sure to get photos of the latest installation in the same area. I headed away from the Tower to journey home for a few short hours of sleep! The alarm was set even earlier on Saturday! I left home at 5.30am as I needed to ensure getting to the Albert Hall for 8.30am. There was plenty of excitement in the dressing area. The last of the participants had arrived so, for the first time, we would have a full compliment. Call time for the Dress Rehearsal was 9.15am and after a short briefing by Louise, we made our way into the Albert Hall once more. While waiting to enter the arena, we were listening to Sir Bryn Terfel sing ‘Roses of Picardy‘ – he made it seem so effortless. Sheku started to play and we entered the arena on cue at the beginning of the third verse. We were dismissed from the arena but were fortunate to be able to stay and take our turn being ‘the audience’ for the remainder of the performance including Sir Tom Jones, The Muster, Sir Bryn Terfel with The Kingdom Choir, the Act of Remembrance and most significantly for me, the Silence and Release of Poppy Petals. This was incredibly emotional. I’ve seen it so many times on TV over the years but had never thought I would witness it in person (let alone be part of the festival). I also knew by this point that I wouldn’t be able to be present to see it during the public performances so this was my opportunity listen in wonder to the Buglers of the Royal Marines as they immaculately performed Last Post and Sunset. The dress rehearsal complete, I was able to quickly retrieve a poppy petal from the arena floor before heading back to the holding area at Imperial College. We had a quick debrief and the timetable for the rest of the day was finalised. We then headed to lunch. I’m not sure that ‘sausages with gravy’ or ‘chicken curry’ were the best things to have on a menu for people worried about spilling something – not least because we were briefed that we would be heading straight to the afternoon performance after we had finished! At 2.30pm we headed through security and back into the Albert Hall to our designated staircase. We arrived earlier than we had been used to during rehearsals and was able to hear the VT, the entrance of the bereaved families and Sheridan Smith singing ‘Are You Just Sleeping?’ Even without the visuals you could tell how poignant it was from the audience reaction. Nerves started to kick in! Before we knew it, the strains of Hallelujah had begun and we received our cue from Huw Edwards to enter the arena… Staircase safely negotiated, I turned left on my path towards the orchestra and realised that the audience were all holding photos too. It was certainly a moment to take a deep breath! I was later to learn that the audience pictures were ‘stock’ photos that the BBC had printed up in the same style as the ones we were holding and placed on every seat, but as I stood there, I was scanning the photos I could see in case they had duplicated those of our relatives. Huw completed the segment and moved on to the Invictus Games VT and the floor managers gave us our cue to leave the arena. Unlike the dress rehearsal, there was no applause but respectful silence as the audience re-took their seats and we made our way back up the stairs. We headed out of the Albert Hall and back to the holding area just as the heavens opened. It was only 50 yards between buildings, but we got soaked! Luckily, I was able to protect my photo inside my jacket although we did have duplicates in case of emergency! While we were drying out, we sat and talked through our experiences in the arena. 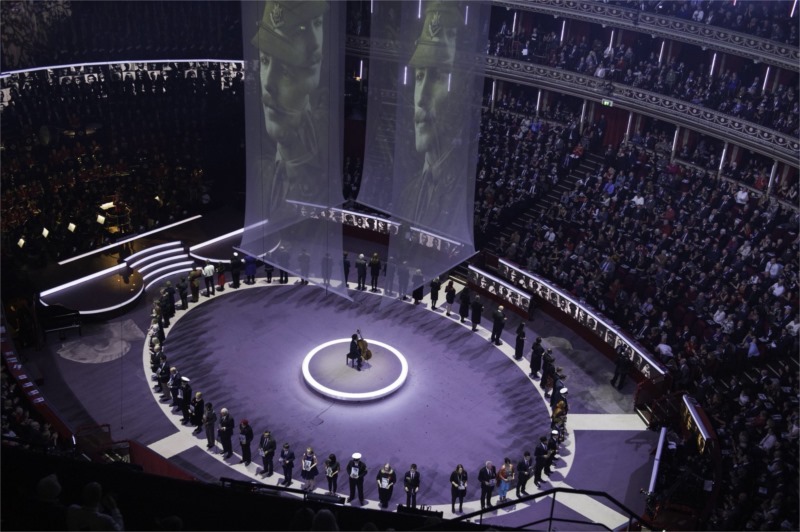 I think we were all a little disappointed that we wouldn’t be able to witness the Service of Remembrance at the end of the festival but recognised how difficult it would be to fit another 60 into an already packed arena. 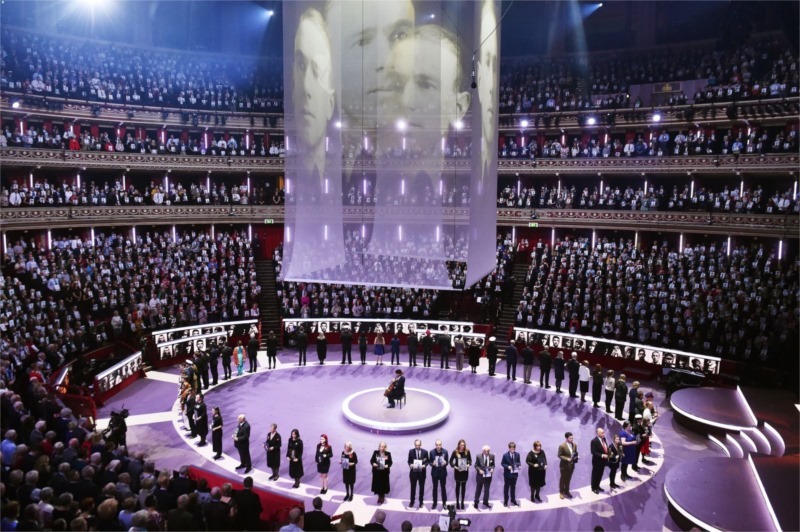 We wondered how many of us might still be around to witness the Centenary of the end of WWII in 27 year’s time? I’ve made lots of new friends. Everyone was so passionate about their family history. We were able to exchange wonderful stories about our relatives. The event definitely created a bond between us and I certainly intend to meet up with some of them again if I get the chance. One of the participants that I spent a lot of time with, Simon Boyd, also lives in Cambridge. 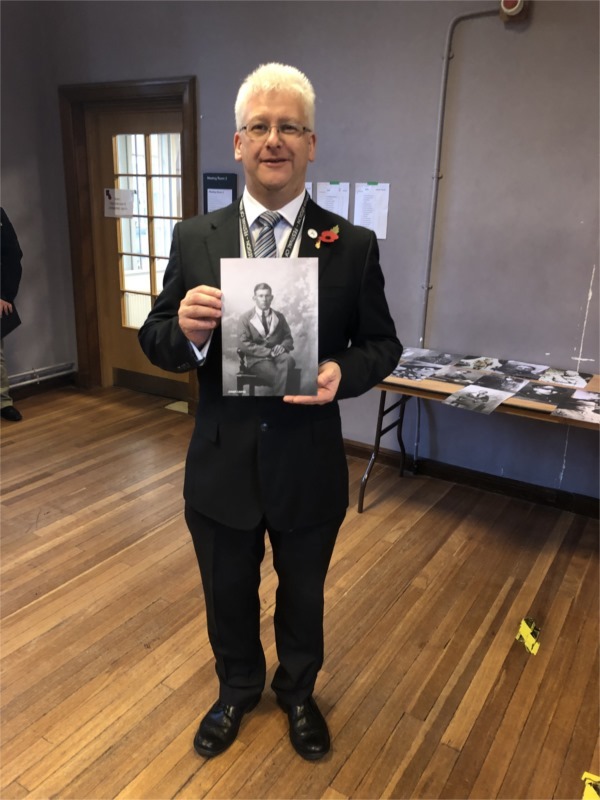 He has written a book about his Grandmother Lady Sybil Grey who transformed her family home at Howick Hall into a hospital in the First World War, before travelling out to Russia to help set up a British Red Cross hospital in Petrograd. He’s due to give a talk about her early next year so I’d like to try to hear it if I can. As the time went on, other members of the production started to filter back to the holding area as their segments were completed. Once the Standard Bearers appeared, we knew that the performance had completed. It seemed a long time to wait until our call time for the evening performance at 7.40pm. Thankfully the rain had eased off by the time we headed back to the Albert Hall and through security for the last time. We made our way to staircase H and there was a noticeably different atmosphere which generated even more nerves as we waited! We listened to Sheriden singing again, the Service Dogs VT and Bryn and in no time at all, Sheku started to play and Huw announced our entry and we headed into the arena. As I entered from behind the curtain (which had hidden us while we waited), I was able to quickly glance up at the Royal Box directly opposite. It made the hairs on the back of my neck stand up as I saw that along with the rest of the audience, they were ALL standing for us and they appeared to be holding photos too! I made my way down the staircase (taking special care not to fall during the televised performance! ), turned left into the arena, halted at my mark and turned to face the audience. All too soon, Huw asked the audience to retake their seats but unlike the afternoon performance, applause started behind me and rippled right around. It made me grow about 2” in height and brought a tear to my eye. Amazingly and purely by chance, I recognised someone I knew from Help for Heroes in the audience as I walked back up the staircase and out of the arena for the last time. We headed straight back to our dressing room and took the opportunity to say farewell to our new friends and leave the vicinity of the Albert Hall ahead of the performance finishing. Once the performance ends the area is completely locked down while the Royal Family leave so we were advised to take the opportunity to leave early without being further delayed. Heading home I was able to collect my thoughts from the last couple of days. While I had already researched the service if Joseph (and his brothers) and had opportunity over the years to ask the occasional question of my Mum, Aunt and Uncles, we never manage to ask all the questions we wish we could have, and all too soon they are gone. I certainly feel much closer to my Granddad now than ever before although I never met him. Did we help keep the memory of our relatives alive? Absolutely! From what I’ve read from Social Media posts, the feedback for the ‘Descendants Walk’ was amazing and it inspired so many viewers to share photos and details about their loved ones too. I can only offer my congratulations to the Royal British Legion and the BBC for coming up with the idea. I will be forever thankful for being asked to take part. I wouldn’t have missed it for the world and the memory will stay with me forever. Subsequently, I was contacted by a BBC researcher who explained that they were interested in the story around who I would be remembering. 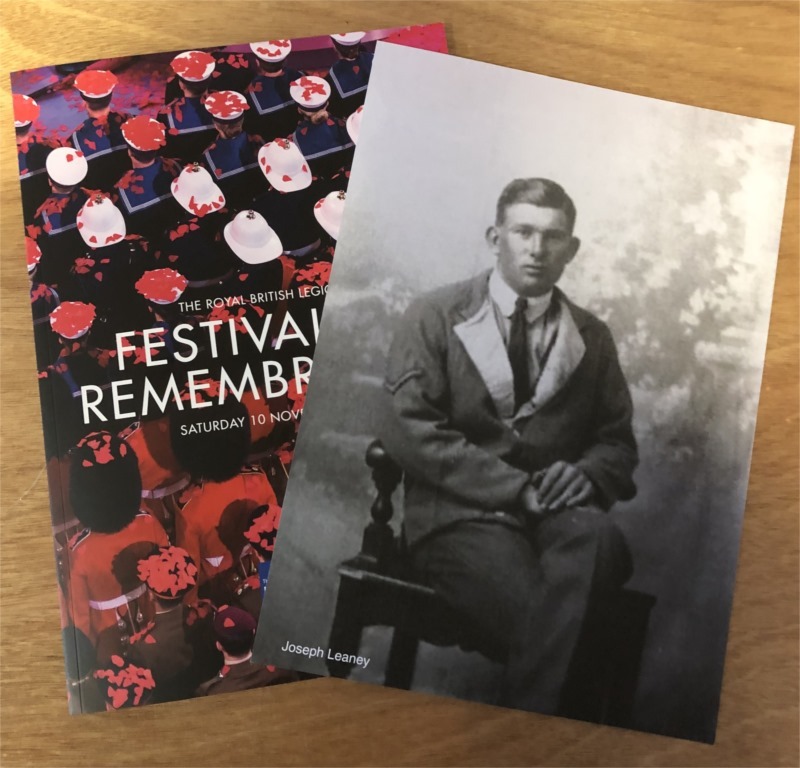 They asked me if I would like to attend the Royal British Legion Festival of Remembrance this year as they plan to include a number of descendants of those that served in WWI within the programme. I have watched the festival each year since I can remember, and never thought that I would ever have the opportunity to take part. I feel deeply honoured to have been asked and it’s difficult to put into words how much I’m looking forward to it. There is a rehearsal to attend next week when I will find out more. There will be a dress rehearsal and two performances on Saturday 10th November. The performances will be attended by The Queen, The Prince of Wales and The Duchess of Cornwall, The Duke and Duchess of Cambridge, The Duke and Duchess of Sussex, The Duke of York, The Earl and Countess of Wessex, The Princess Royal and Vice Admiral Sir Tim Laurence, The Duke and Duchess of Gloucester, The Duke of Kent and Prince and Princess Michael of Kent. The festival is televised and will be shown on Saturday evening on BBC1 at 8.30pm. It’s shaping up to be a weekend that I’ll never forget! 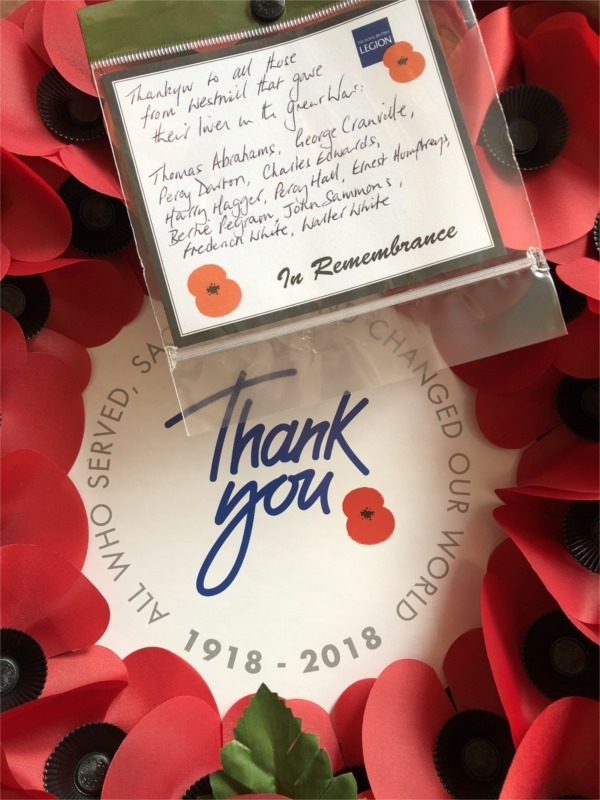 A few weeks back I learned that I have been invited to participate in Armistice 2018, A Nation’s Thank You. 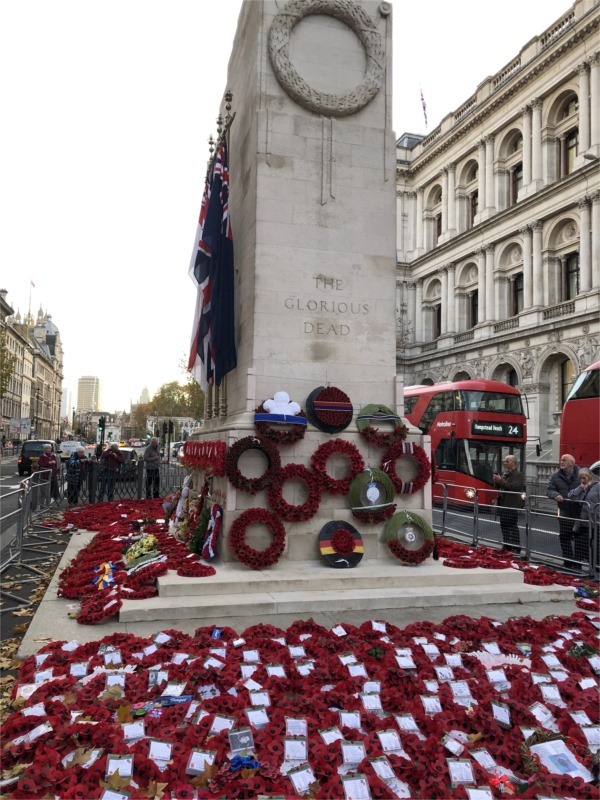 This is a unique opportunity for 10,000 members of the public to form a procession past the Cenotaph in central London on November 11th, to pay tribute to those that served during the First World War. The commemoration will take place on the 100th anniversary of the signing of the Armistice, will recognise the significance of the end of the First World War, and the sacrifice made by so many men and women during the war. The procession will follow the veterans march past that takes place following the National Service of Remembrance. It’s certainly a once in a lifetime opportunity and one that I am incredibly lucky to have the chance to take part in. As part of the process I was asked if there was anyone in particular that I would be remembering, and why? I will be remembering the 11 residents of Westmill, Hertfordshire that I have been researching. 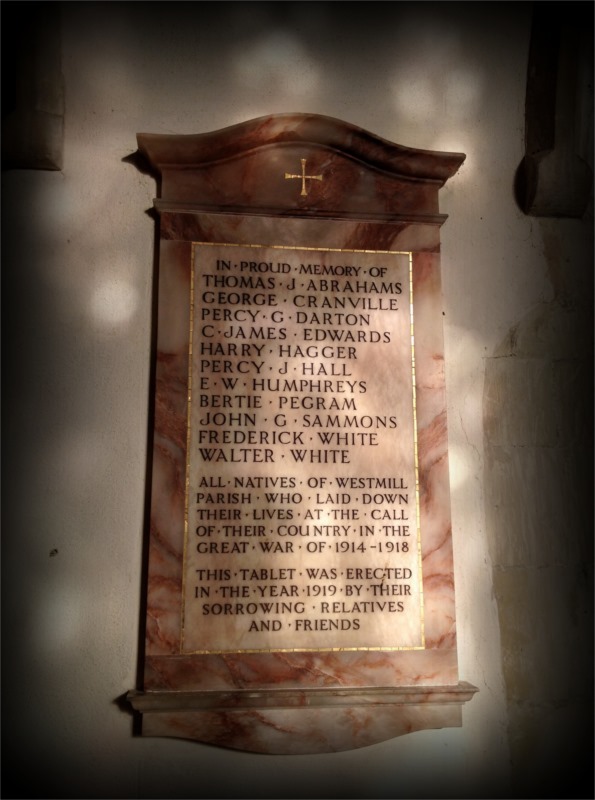 Their names are inscribed on the Village War Memorial found inside St. Mary’s Church. It has been a fascinating and humbling experience learning about these individuals and trying to piece together some of their background. As some of you will know, I play Last Post and Reveille at the Remembrance Day Service at Westmill, a task that I will be unable to perform this year. However, in their honour, I will be taking a poppy wreath with me to the Cenotaph inscribed with their names. A much more personal memory will be that of Joseph Leaney, my Grandfather and his two elder brothers, Henry and Fred. In May, 1918, several hundred men from eighty-three different regiments and units and of medical categories Band C, including many suffering from wounds, rheumatism and general debility, were collected at Habarcq, near Arras, and formed into the 4th Provisional Guard Battalion, under Lieutenant-Colonel G. Hesketh, D.S.O., T.D., of the 5th Loyal North Lancashire Regiment, being allotted to the 59th Division. On 26th May it was renamed 23rd (Garrison) Battalion The Lancashire Fusiliers, at Hesketh’s suggestion. For some time it was employed in digging trenches around Habarcq. It was transferred in June to the 121st Infantry Brigade in the 40th Division, to the surprise of some of its members who, having lost fingers and otherwise contributed physically to the war, did not expect to be called upon for any further fighting. Its establishment of officers was never raised in proportion to its new status, so that it was denied its due share of promotion. In spite of its initial handicaps, it soon developed a wonderful esprit de corps; and after its weakest members had been weeded out it became a unit fit enough to be inspected by Field-Marshals the Duke of Connaught and Sir Douglas Haig on 2nd July and to be classed as a fighting unit. The word “(Garrison)” was therefore dropped from its title; and it took an active part in the closing events of the campaign in France and Flanders, being finally disbanded in April , 1919. 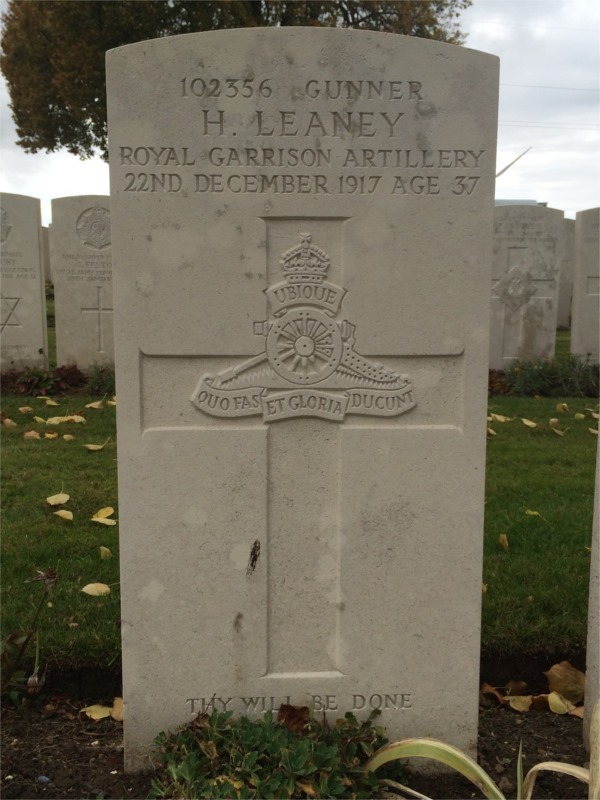 Henry Leaney enlisted on 11th July 1916 and joined 157 Battery, Royal Garrison Artillery. After training, Henry arrived in France on 25th January 1917 (157 Battery had been in France since 30th November 1916). Henry died of injuries accidentally received when kicked by a horse on 22nd December 1917. He was 38, married to Elizabeth and had two children, Albert (15) and Florence (13). 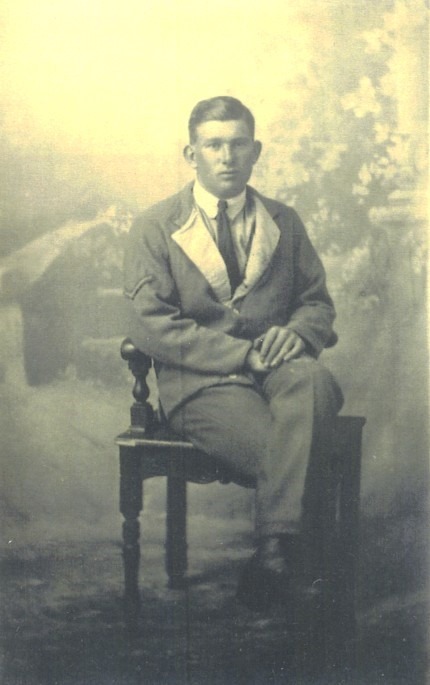 Fred Leaney joined up just two days after his brother. 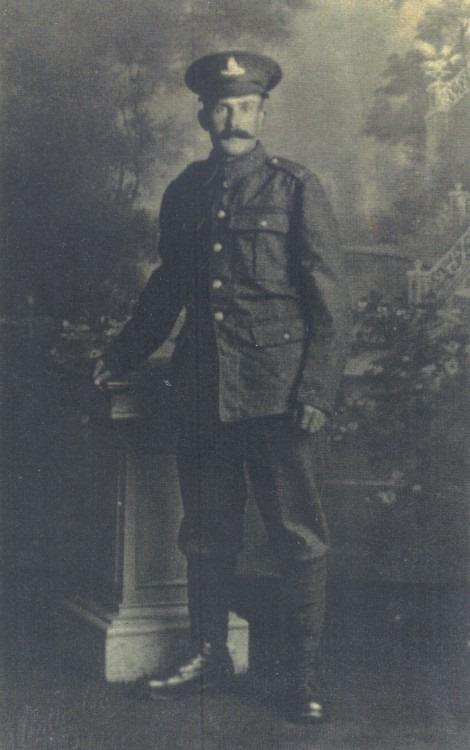 On 13th July 1916 he joined 230 Siege Battery, Royal Garrison Artillery. After training in the UK, 230 Battery along with Fred were deployed to France on 17th January 1917. 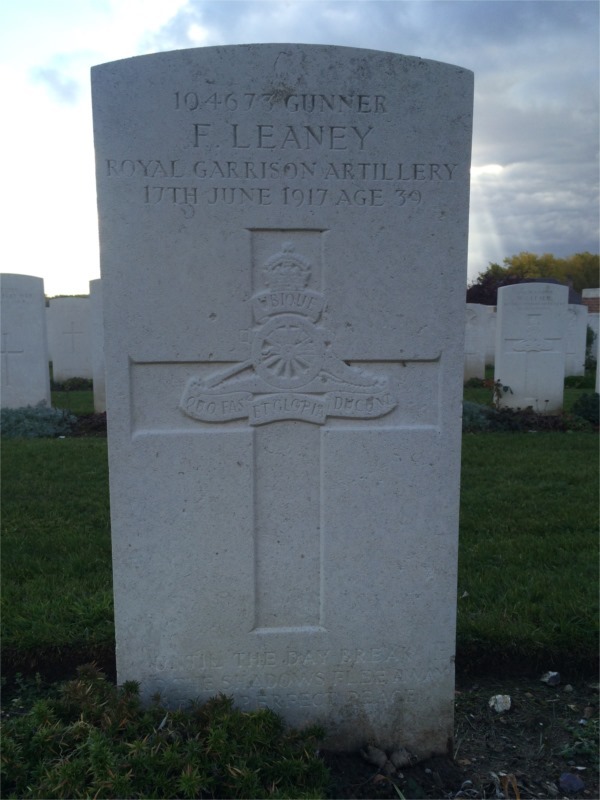 Fred was killed in action at Arras on 17th June 1917. He was 39 and had been married to Kate since 26 December 1914. Interestingly for a Sussex based family, he married Kate in Littlebury, Essex, not too far from where I live now. The brothers are now at peace just 30 minutes apart. Both are in the care of the Commonwealth War Graves Commission. Henry is buried at Achiet-le-Grand and Fred at Athies. I was fortunate to be able to visit them both a couple of years ago to pay my respects. After our celebration meal last night, we were given a chance of a lay-in. Breakfast at 7.30am then packed and away at 8.30am. It was due to be another warm day. Despite various aches and pains, everyone was looking forward to it but more than a little disappointed that our adventure was drawing to a close. We set off in peloton and stayed close together for the first 5 miles. 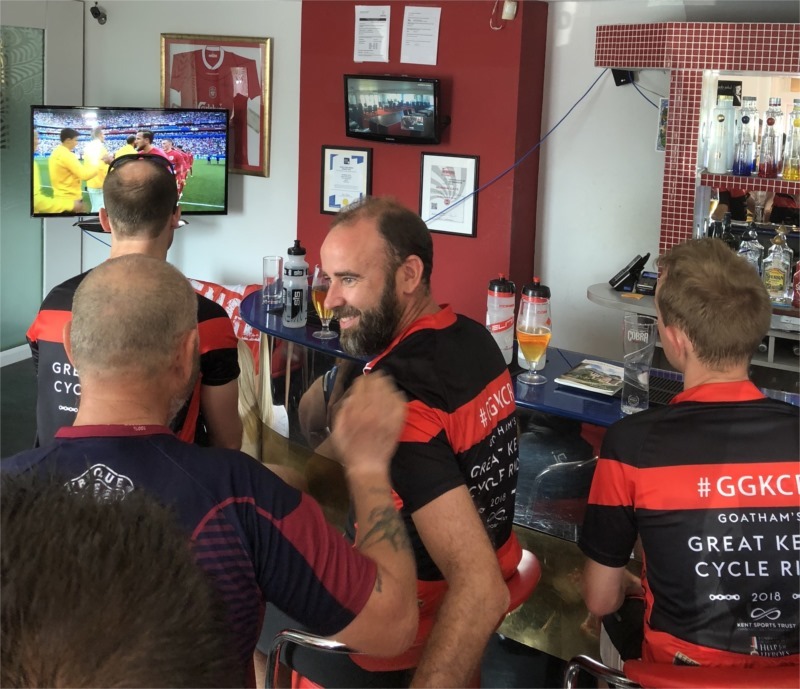 By this stage in the ride you normally know who is likely to be cycling around you as groups of cyclists of similar ability tend to gravitate towards each other. 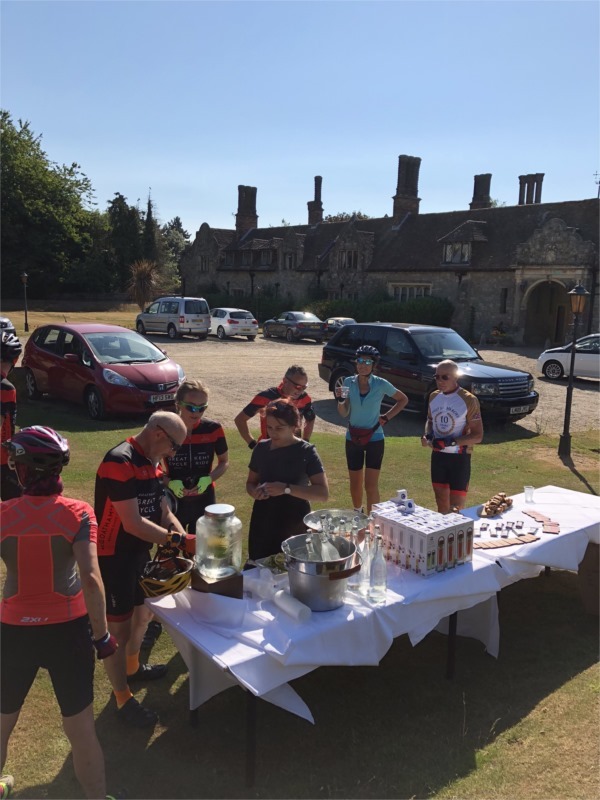 After just 5 miles we were treated to a short stop and some healthy refreshments courtesy of Eastwell Manor. 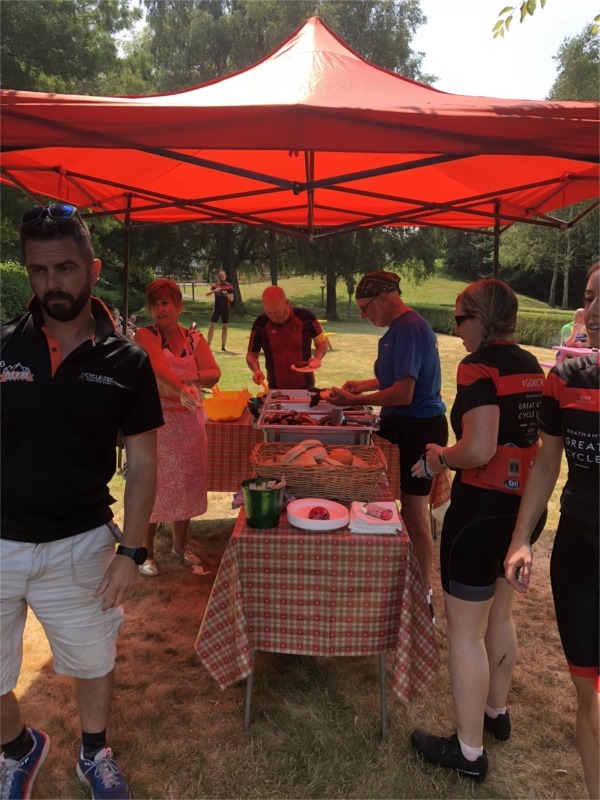 A lovely setting and ice cold drinks were gratefully received even though were were only 30 minutes into the days riding. Mini treatments were apparently on offer but I don’t think that anyone succumbed. I think that if anyone had, that would have been their day ended in the relaxing environment of a Champneys Spa! 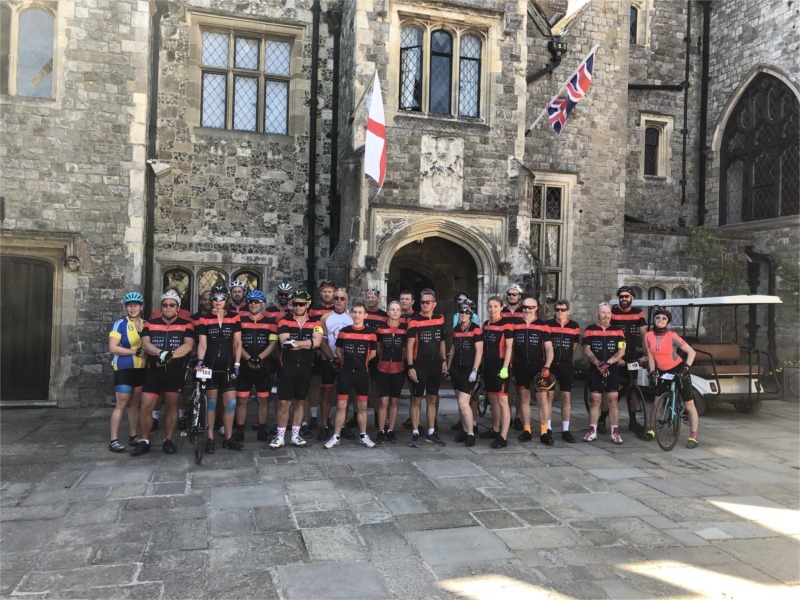 We were searching around for a bit of shade and ended up in the courtyard for a team photo before heading back out and onto our biggest challenge of the day – Wye Hill. Steve had been psyching us up for this one! It’s regarded as one of the Ten best cycling climbs in Kent and after 1.7 miles of gradients up to 10% you can see why. The view from the top of the North Downs is stunning (I actually got photographic evidence this time!). I’m pleased to say that I maintained my record of cycling up all of the hills and not having to resort to walking. To be honest, I was feeling quite pleased with myself by this point but I was soon to come crashing back down to earth (though, thankfully not literally). A couple of miles after the photo was taken I was riding with a couple of the ride captains and we were making really good progress when I suffered a puncture. Not a problem… I have these all the time and know how to swap a tube and get going again (or so I thought). The tube was duly replaced and the tyre was inspected for the culprit – there was a lot of flint washed on to the road. I got ready to go but as soon as I sat on the bike it punctured again. It transpired that the cause was in deed a razor sharp bit of flint but it had actually slashed the sidewall of the tyre and I hadn’t noticed in my haste to get moving again. The tyre was beyond repair so the ride captains (Adrian, Richard and Steven) kept me company while we awaited the Cycle-Tec support vehicle to bring me a replacement tyre which was fitted without further incident and then the ride captains did their best to haul me along the road a little quicker than I would have otherwise gone in an attempt to recover some time to the next water stop at 20 miles. The spirit of this ride is such that everyone waited at Chartham for me even though I’d delayed them by nearly 30 minutes. Lunch was at 30 miles at the Shepherd Neame Brewery in Faversham. 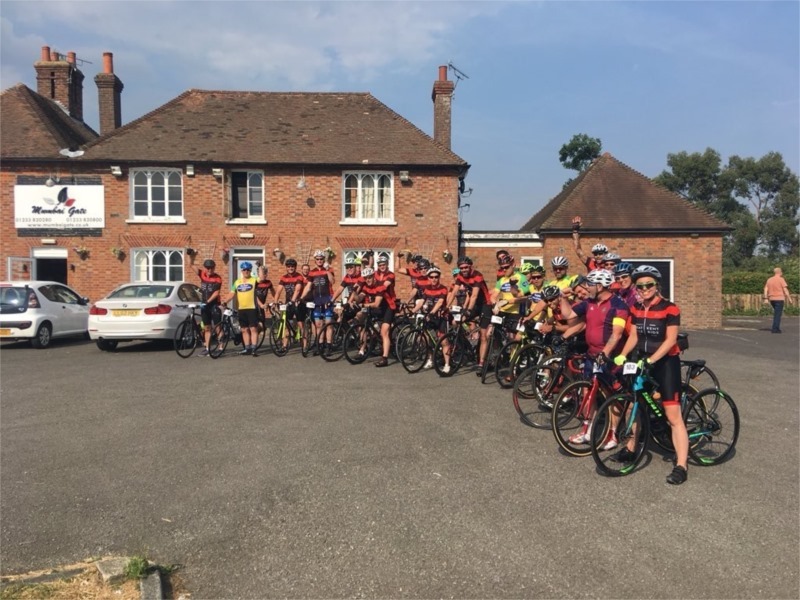 We grouped together on the outskirts of Faversham and cycled the last couple of miles together. There was a real buzz when we reached the Brewery. There were plenty of supporters waiting for us and the hospitality we received was second to none. Complimentary drinks (but I had to keep reminding myself that there was still 30 miles to go plus I needed to drive home) and a superb pasta lunch were gratefully received. The sports therapists from UEL that had been supporting the bike ride across all three days, seemed to be very busy all of a sudden before we left Faversham and continued on our journey. 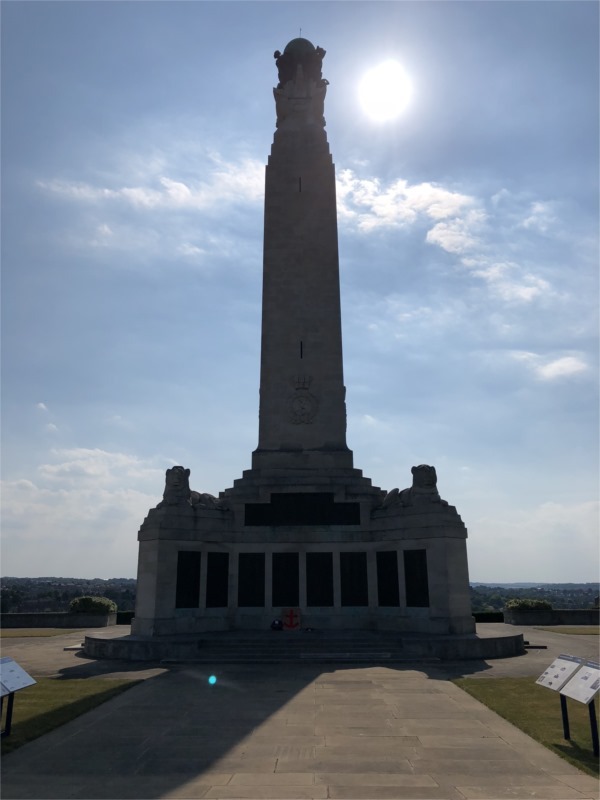 The final stop of the day was to be at the Naval Memorial at Chatham for an opportunity to reflect and remember those naval personnel who have no grave. There are three naval memorial, all built to the same design; one in Chatham, Plymouth and one in Portsmouth (which I visited the day before my very first Help for Heroes Ride in 2009). Steve gave a short introduction, wreaths were laid and Garrie (my room-mate and ex Royal Engineer) read the exhortation. A short silence was kept before Steve invited us to look at the names on the memorial (there are more than 8,500 from 1914-18 and over 10,000 from 1939-45) and remember one name on the 11th November this year. 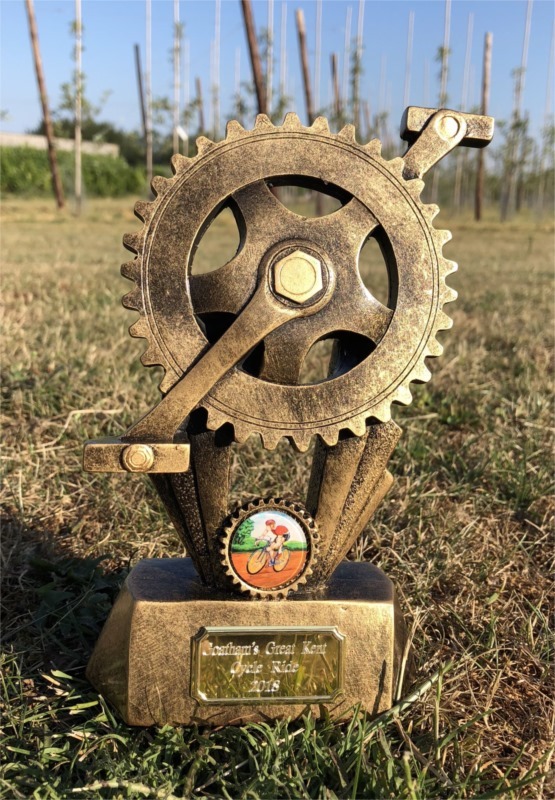 From the memorial we rode in small groups through Chatham, Rochester and Strood before joining up again in Hoo so that we could ride to the finish at Goatham’s as one. Like last year, there were a large number of riders’ friends that welcomed us home with banners, hooters, flags and cheers. 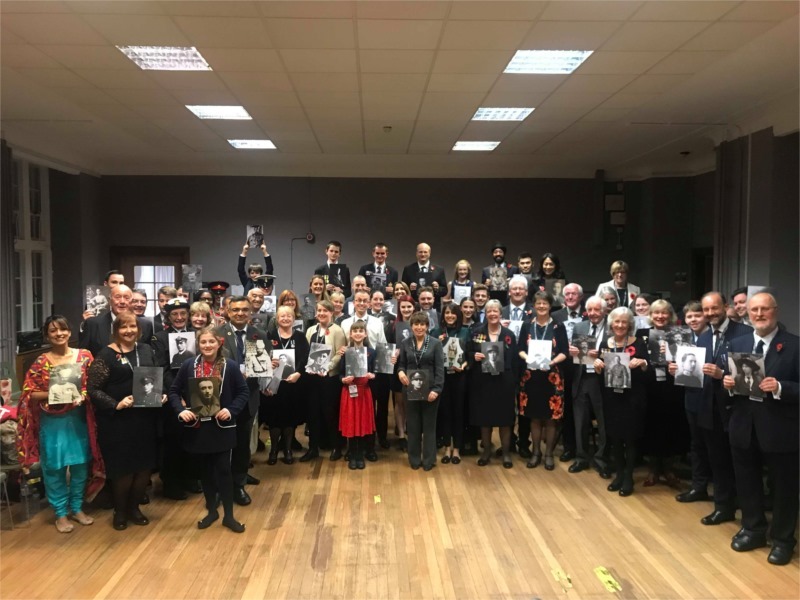 We were treated to a glass of bubbly to celebrate our achievement before we had farewell speeches from Steve Craddock on behalf of Help for Heroes, Steve Wolfe on behalf of the Kent Sports Trust, and Clive Goatham who presented us with our trophies. I’m really excited at the prospect of doing it all again next year. If you’re interested then please drop me a line and I’ll only be too happy to put you in touch with the organisers. AKA: more ups and downs than watching an England match! If we thought yesterday was warm then today was a tad warmer still. I think it peaked at 32 Deg C but it wasn’t as humid as yesterday. We set out after an early breakfast and were on the road by just after 7.30am so we got a bit of a head start on the temperature. I set out with Steve and Duncan. 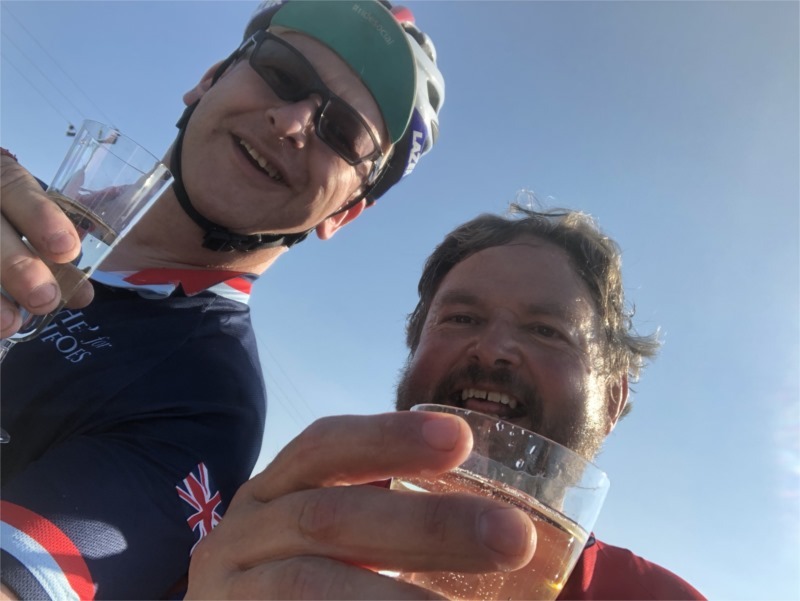 I’ve ridden with Duncan before – both during Steve’s John O’Groats to Lands End ride and at last year’s GGKCR. 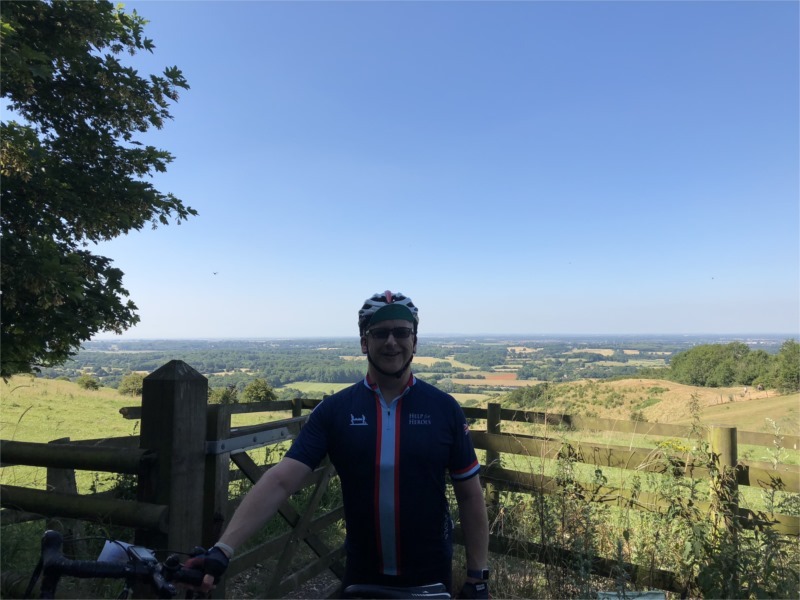 Duncan suffered a serious heart attack a couple of years ago and the fact he’s around to tell the tale is amazing in itself but to push himself on a ride in the sort of heat we experienced today is astonishing. 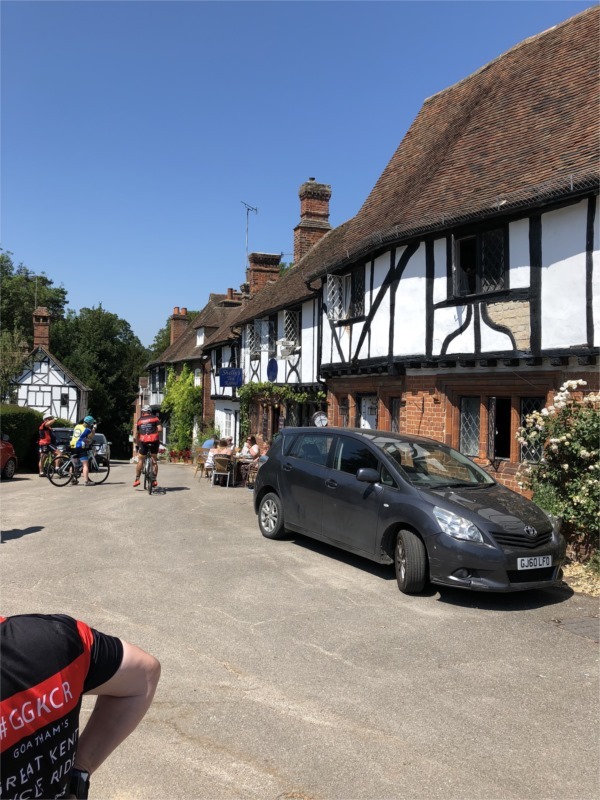 We made steady progress to the first water stop at Sissinghurst after 19 miles by which time it was starting to warm up nicely. 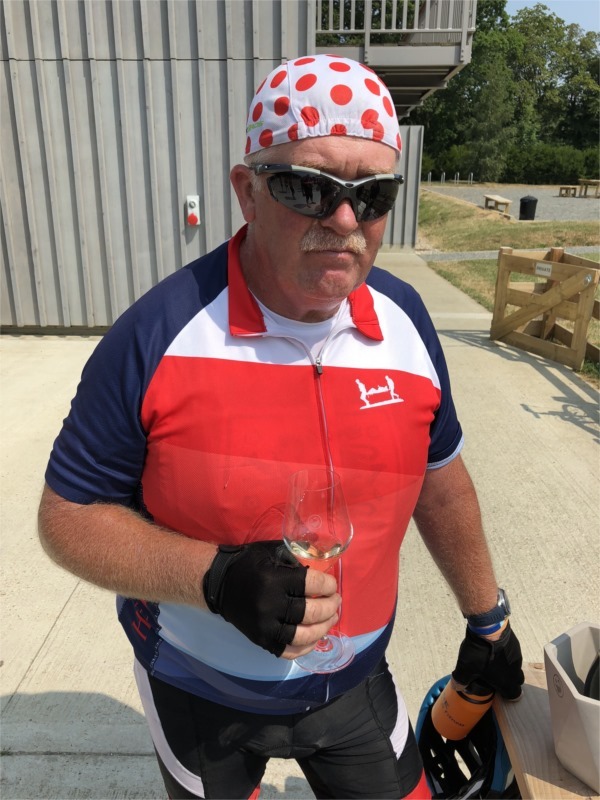 We headed on to our 2nd water stop after 36 miles at the Gusbourne Vineyard (well, I suppose there’s some water content somewhere in a bottle of sparkling white wine isn’t there?). The wine they had for us to taste was wonderful although in the heat, looking for a cold drink, I’m not sure we made the most discerning of customers. Leaving the vineyard we hit our first big climb of the day up onto the Weald. It was hard work but by now our little group had grown to include Garrie (another ex-Sapper, who I’m sharing a room with) as well as Carol from Goatham’s. We all made it giving each other encouragement as we made the climb. The view from the top was stunning but the promise of a nice downhill stretch limited the opportunity for photographic proof on this occasion! After the big hill, we had to contend with what seemed like an endless series of rolling hills all the way to Hythe at 48 miles and lunch. Holiday Extras put on a great BBQ for us but the thing I was most grateful for was the supply of ice cold drinks. 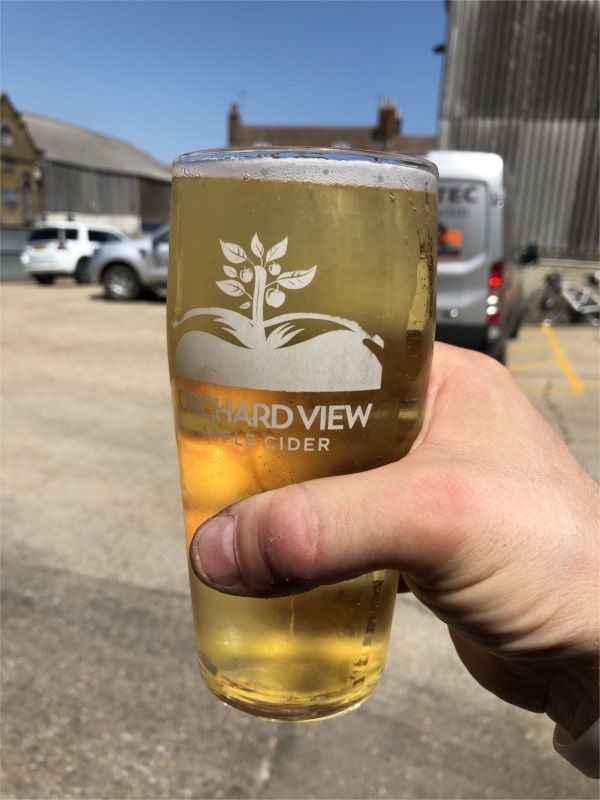 Having plenty of water to carry on our bikes is essential for a ride like we are doing but it doesn’t take long to warm up. Suitably recharged, we headed 19 miles towards our final water stop of the day. We encountered one final big climb before settling down to more rolling hills again but nothing quite as draining as we experienced before lunch. 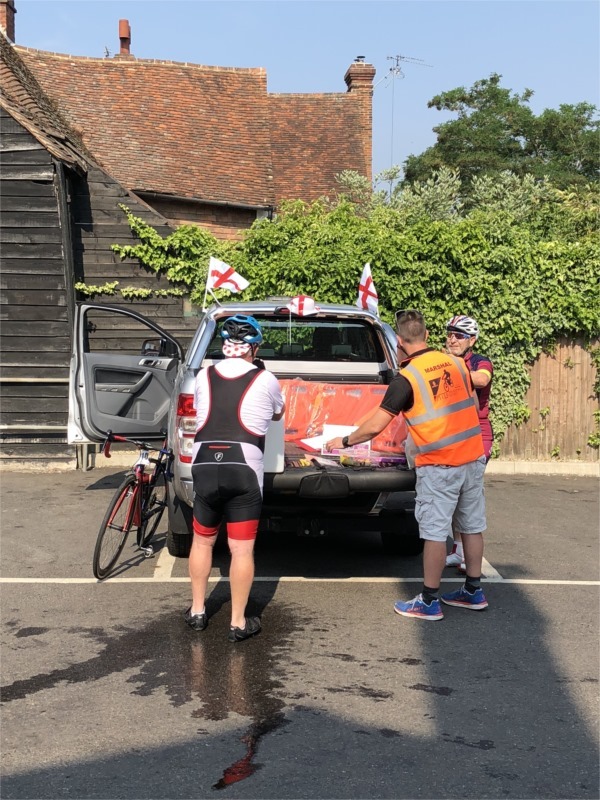 We rolled in to our ‘water stop’ at Bethersden at about 2.55pm just in time to get a drink and settle down for England vs Sweden. It has to be said that the roads were deserted from about 2.00pm. That’s twice in a week I’ve experienced quiet roads when there’s an England game on. 74 miles completed (my GPS track seemed to have failed between lunch and the afternoon water stop though) and there was just enough time to cool off before dinner. It’s been a great couple of days. We have the small matter of 60 miles tomorrow with a couple of big climbs thrown in to test us as we return to Hoo. Lunch at the Shepherd Neame Brewery should be good too! Thanks for looking at the blog. I’ll update with my experiences from tomorrow as soon as I can. What a great day to start my latest adventure! It was an early start this morning having travelled down to Chatham yesterday evening and stayed locally. Registration was at Hoo from 6.45am. When I arrived I signed in and was provided with all of the info I needed for the weekend. My overnight bag was loaded into the van and I prepared myself and my bike for our departure at 8am. 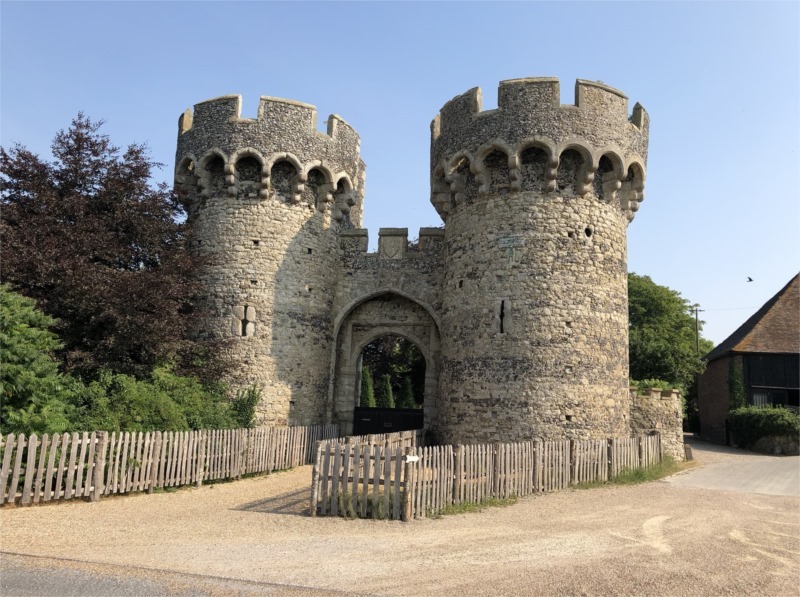 We left Hoo and explored the Hoo Peninsular before turning at Cooling Castle and heading back towards Rochester. Our first water stop was at 24 miles and it was most welcome as it had really started to warm up. The riding pace was deliberately ‘social’ and the terrain with only slight undulations. I knew more was to come later in the day though as I’d seen the profile of the proposed route! We then headed on to lunch at 39 miles. 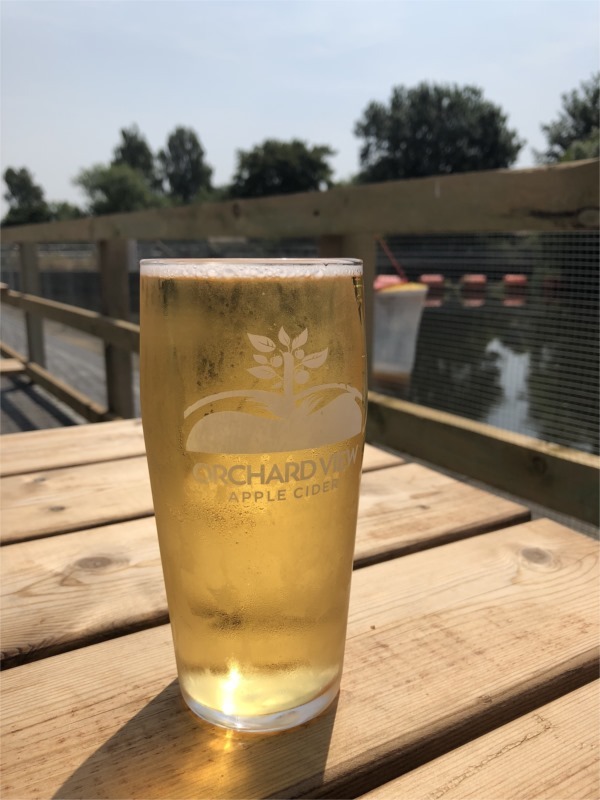 We’ve been fortunate this year as one of the ride sponsors is Shepherd Neame Brewery and they invited us to have lunch at The Boathouse in Yalding. The setting by the river was superb and the hospitality and food excellent. I noted that it is a dog friendly establishment too so we hope to come back and visit again in the future. I successfully managed to negotiate the ascent of the two main hills of the day. In 30 degree heat they were challenging but I didn’t get off and walk! There was only 20 miles left of the day’s ride to get to Ashford and our overnight accommodation. 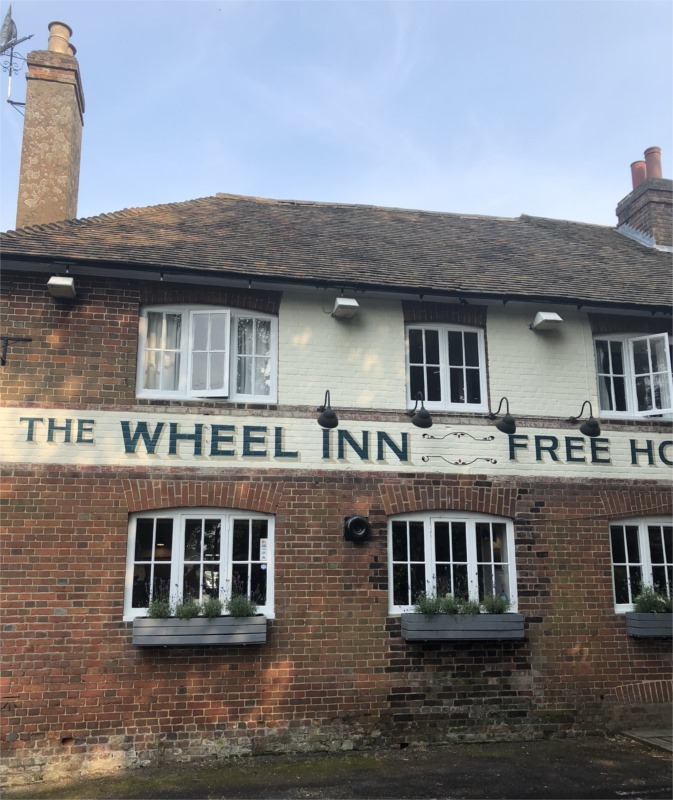 We did stop about 4 miles from the end in order to regroup for the final run in but despite the closeness of an aptly named hostelry, we remained resolute and didn’t venture in! Upon arriving at our hotel there was time to get showered and changed before our evening meal. 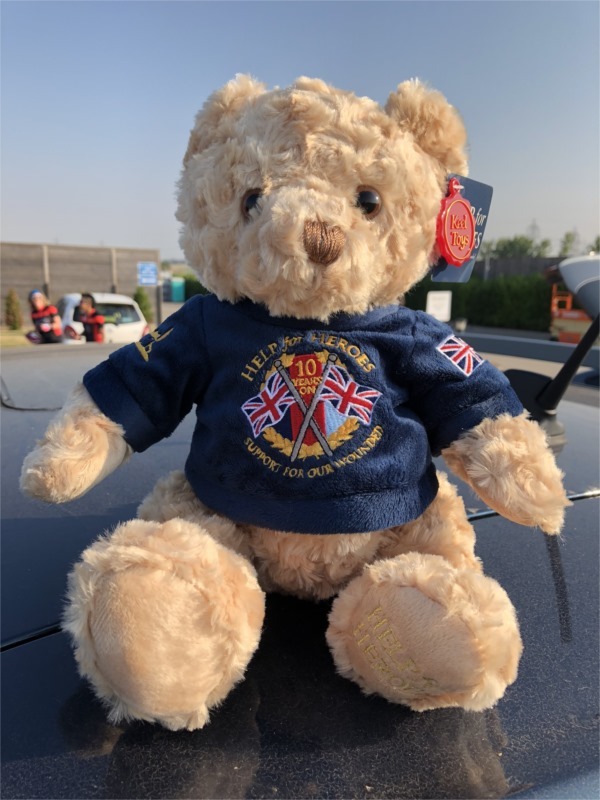 Tomorrow will be another early start as we hope to be on the road by 7.30am (which should help us make some progress before it warms up again) so after dinner, the majority said tired farewells and retired to their rooms. Tomorrow’s itinerary includes a first ‘water’ stop at Gusbournes Vineyard in Appledore, a Barbeque lunch at Holiday Extras in Hythe (where we were treated to a wonderful afternoon tea last year) before heading to Bethersden where we intend to cheer England on into the Semi Finals of the World Cup. What could possibly go wrong?! You should be able to view today’s route in more detail by clicking on the picture below.